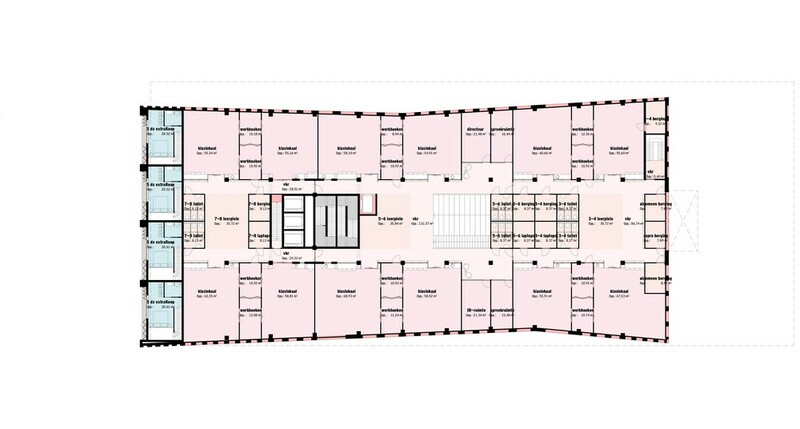 Commissioned by Synchroon, Orange Architects has designed an all-in-one school and 190 apartments on the site of the existing SITA office on Heathrowstraat in Amsterdam. 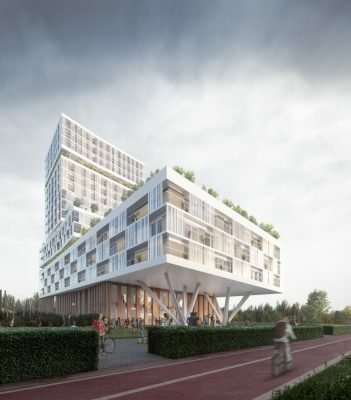 The project, Called Floating Gardens, made with the city of Amsterdam, proposes an integral development with a school in the plinth and 190 apartments above. 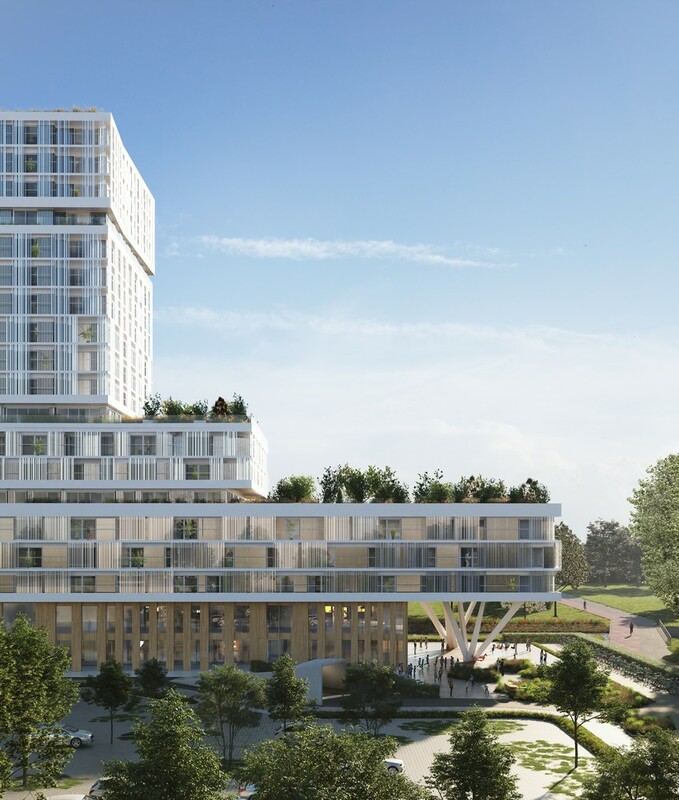 The area around Sloterdijk station is rapidly transforming from an office district into a mixed-use residential and office district. Sloterdijk Centre will form the heart of a large-scale area development called Haven-Stad. Sloterdijk is currently an area of remarkable contrasts. It features an international yet monofunctional office district combined with surprisingly soft areas such as Orlyplein and the Garden of BRET. A second striking characteristic of the area is its location in the middle of the green wedge called Bretten Zone. 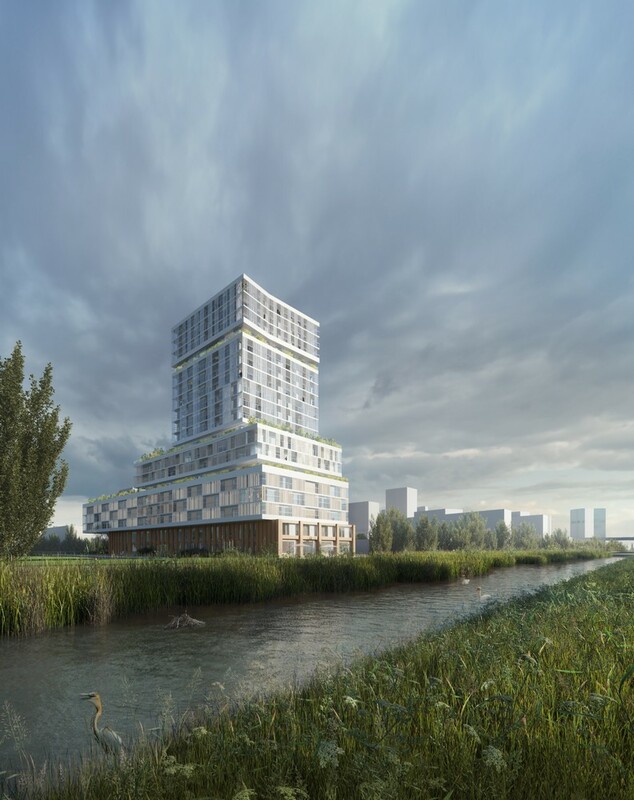 Sloterdijk is a stony island located between Westerpark and the Bretten nature area, but it has the potential to become a fully-fledged part of this green network. 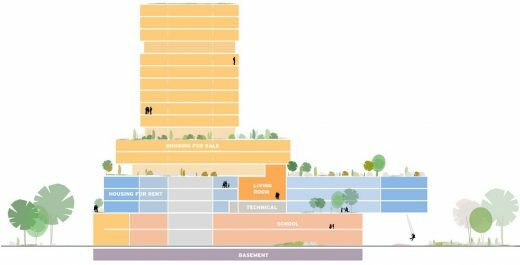 Finally, Sloterdijk offers space for new initiatives. Vision and commitment are essential components in developing a district that, at present, offers little in the way of spatial quality. 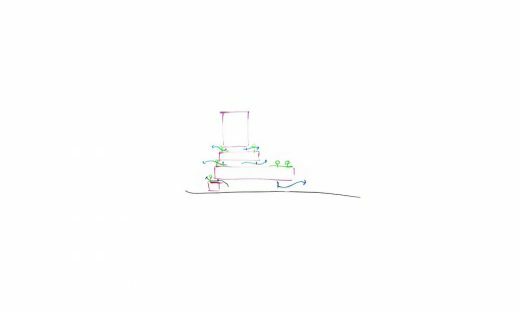 The contrasts, the green potential and the availability of space make Sloterdijk a place of unparalleled potential. With Floating Gardens, we are making a place where pioneers can actively contribute to the development of their building and neighbourhood. A place that highlights the contrast between ‘Small Scale Community’ and ‘Big City Living’. 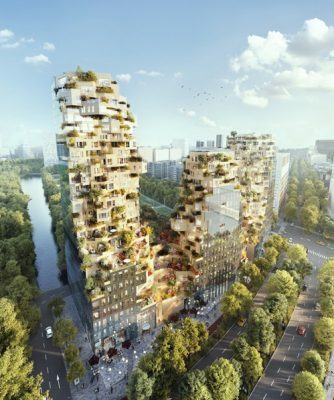 And a place that combines an abundance of greenery with living in a dynamic city. The occupants of the first residential buildings form a select group that will settle in the area and become catalysts that will transform Sloterdijk. A high-quality programme is being developed for this group, the focus of which is sustainability, shared facilities and inspiration. Floating Gardens is an iconic building that gives Sloterdijk a recognizable face towards Haarlemmerweg and Spieringhorn Park. 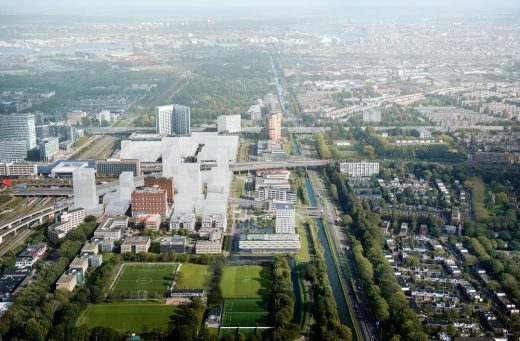 Construction of the all-in-one school will strengthen Sloterdijk Centre as a mixed-use residential and office district. 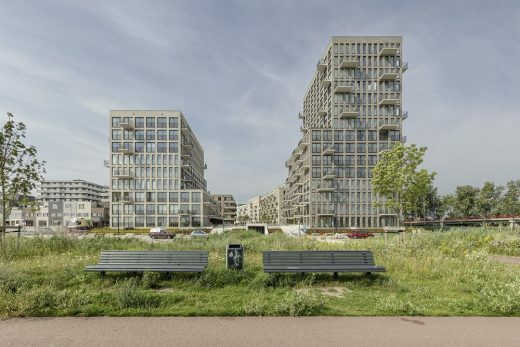 In view of its location beside the Bretten Zone, special attention has been given to the integration of the project into the landscape and to the green roof landscapes of Floating Gardens. 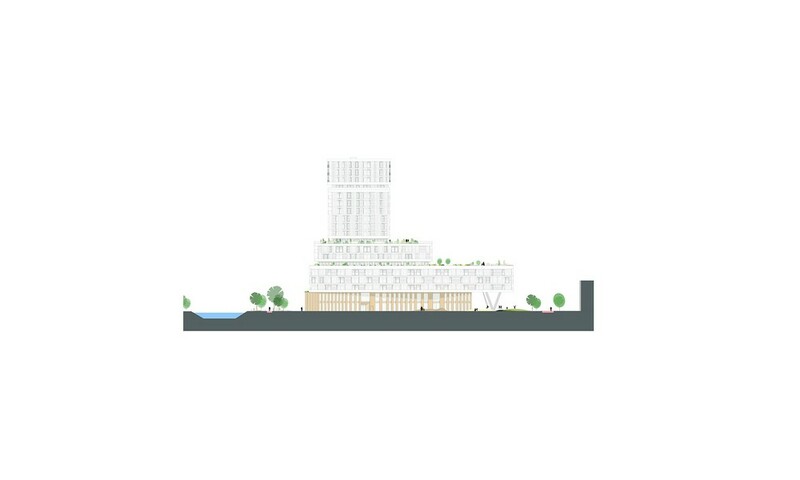 To this end, the building is deliberately made up of layers of various size, thereby allowing green roof gardens to be made on various levels on the building, improving biodiversity in the city and the welfare of residents. 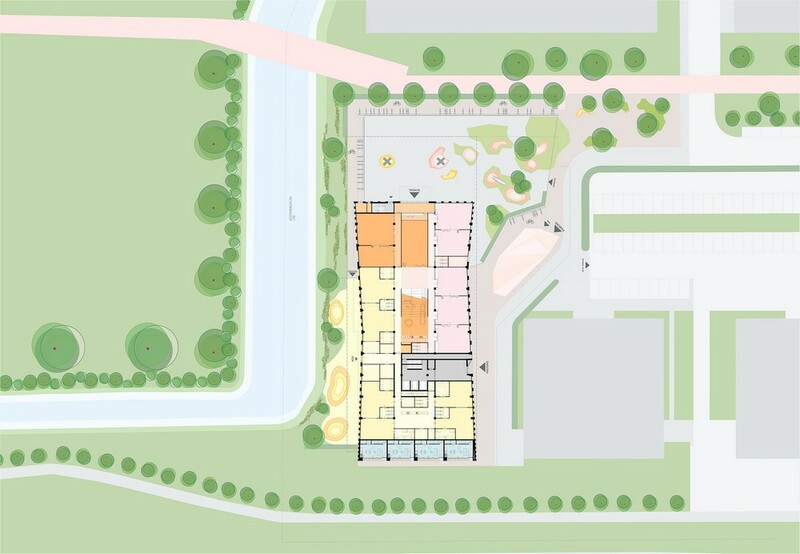 In addition, a large overhang on the entrance side of the school acts as a generous lobby for the entrance to the park. Sharing is the latest craze! Situated in the heart of the building, beside a green outdoor space, is The Living Room. 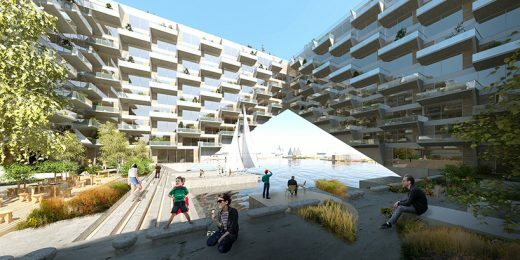 An informal meeting point for the residents of Floating Gardens. This is where they can read the newspaper, work on their laptops, eat lunch together, have a drink with fellow residents, or enjoy an evening meal with friends. 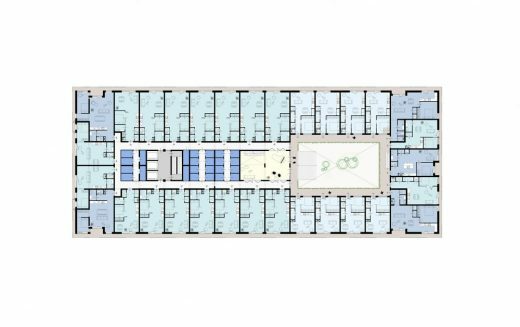 The Living Room creates a sense of community and vibrancy inside the building and ensures that the mental living space of residents is bigger than that of their own studio apartment. This in turn improves the quality of life inside the building. The ‘all-in-one’ school consists of a primary school for 17 classes. 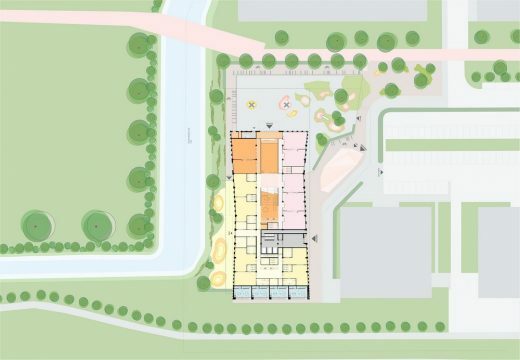 There is capacity for about 400 children, a day care centre, preschool and after-school facilities. The school occupies the first two floors of the building. Collaboration between the various parts of the all-in-one school results in a broad learning environment during and after school hours, with the aim of generating maximum development opportunities for all children. Special attention is devoted to various green play areas and outdoor spaces located around the building. 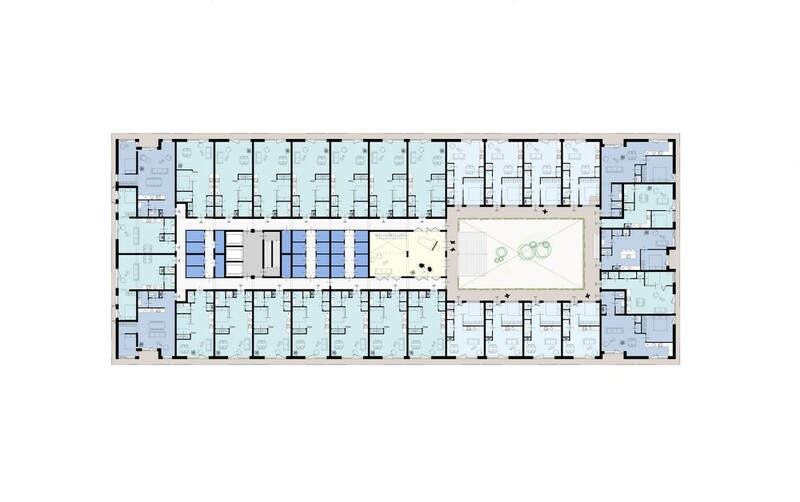 The 190 apartments of Floating Gardens are located on the third to the seventeenth levels. Half of them are mid-segment rental homes and half are private sector homes. That makes the location affordable for a wide range of residents. Orange Architects was established in 2010 as a multidisciplinary design firm, working in the fields of architecture, interior design and urban planning. The goal is to guide clients on a successful path towards inspiring, powerful and rich environments in every design scale. 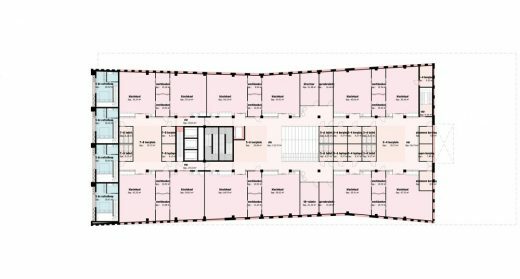 From urban (re)development to product design; from collective housing to luxurious villa; from office planning to private interior. 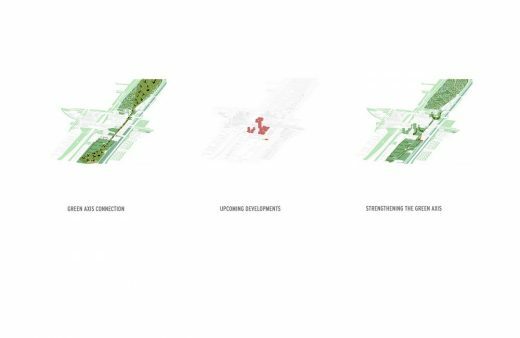 Orange Architects has been working on ambitious projects in The Netherlands, Russia, Cyprus and the Middle East, particularly in Lebanon and Saudi Arabia. The designs draw great inspiration from both local culture and cutting-edge design techniques. The projects display Orange’s prime merit: the ability to embrace local traditions – and fuse them with new, innovative ideas and forms – creating synergy between present and future, between what is happening today and what will be tomorrow. 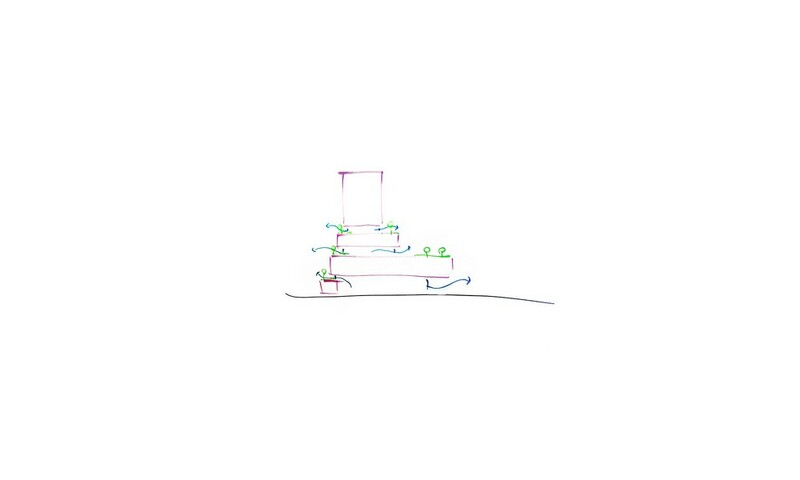 Orange Architects develops appealing, conceptually sophisticated responses to complex spatial challenges. Our rational approach is tempered by our sensitivity to local character, the setting and the users.Orange Architects takes pleasure in transforming your ideas, your dreams and your wishes into inspiring places to live, work and relax.